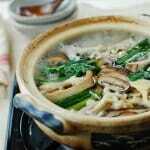 A healthy, delicious Korean hot pot made with mushrooms! It’s vegan and so easy to put together! Today’s recipe is a very simple version of Korean hot pot dishes called Jeongol (전골). It’s a hearty, steaming one-pot meal that’s cooked at the table. 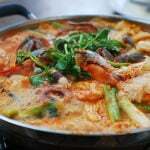 Jeongol is an elaborate Korean stew that used to be part of the royal court cuisine. 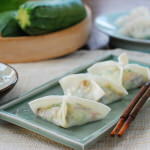 There are many variations, including dubu (tofu) jeongol, haemul (seafood) jeongol, mandu (dumplings) jeongol, etc. To make a jeongol dish, you basically arrange a variety of (mostly raw) ingredients neatly in a shallow pot, then add the seasoned broth, and cook at the table. 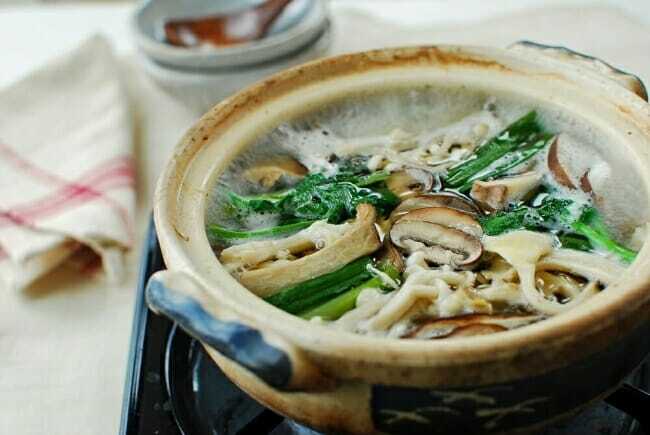 Beoseot (mushroom) jeongol is made with an assortment of different types of mushrooms. It’s a great way to enjoy the strong earthy flavor of mushrooms. This dish is traditionally made with other vegetables, beef, seafood and/or tofu in a beef or anchovy broth. I made it simple and completely vegetarian! The recipe can be easily doubled for more people. 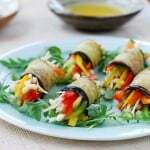 It’s a healthy meal that will warm you up on a cold winter day! 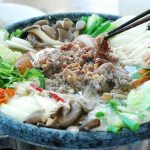 A healthy, delicious Korean hot pot made with mushrooms! It's vegan and so easy to put together! 8 - 10 ounces assorted mushrooms button, shiitake, oyster, crimini, enoki, etc. 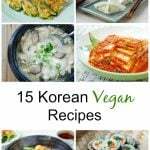 You can add tofu and/or other vegetables such as Korean radish, napa cabbage, onion, and carrots. Put 5 cups water and the broth vegetables in a medium size pot. Bring it to a boil over high heat. Reduce the heat to medium and simmer for about 15 minutes. 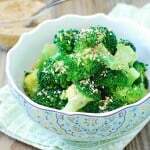 Discard the vegetables. Season with the soup soy sauce, salt and pepper to taste. Cut the mushrooms into bite size slices (about 1/4-inch thick). Mushrooms cook down quite a bit, so don’t cut too thin. 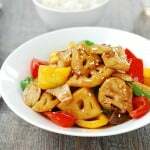 If using oyster mushrooms, split lengthwise into bite size pieces. 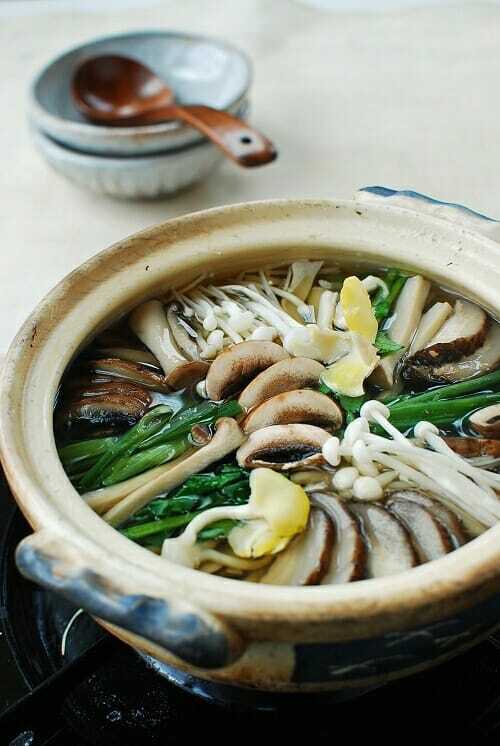 Neatly arrange the mushrooms and scallions in clusters in a shallow pot. Add 2 cups of broth. Boil over medium to medium high heat until mushrooms are softened, 4 – 5 minutes. You can add more broth and any remaining ingredients while eating if you’re cooking at the table. First of all those pictures are just so beautiful and as always making me hungry. I love hot pot, and you arranged those veggies perfectly! Happy Holiday season to you and yours!!!! I love this one pot meal and can’t wait to make it. Happy Holidays to you. What a beautiful dish! I love big warm bowls like this for dinner on cold nights. I’m glad I found this recipe. I have cooked this a few times already! Thanks. MY HUSBAND AND I TAUGHT IN KOREA FOR THREE YEARS ABOUT 15 YEARS AGO. WE USED TO FREQUENT A RESTAURANT NEAR OUR APARTMENT THAT SERVED THIS AND IT WAS MY ABSOLUTE FAVOURITE. I HAVEN’T SEEN IT HERE (TORONTO AREA) AND ASSUMED I WOULD NEVER EAT IT AGAIN! I CAN’T WAIT TO MAKE IT! I bet that was delicious! I’m glad my recipe brought back your memory of the food you enjoyed in Korea. Hope you make it soon. Sorry to hear that! Did you also reduce the time to cook by half? Adjust the time and use more water next time.